Samsung's Foldable Smartphone Is Real! 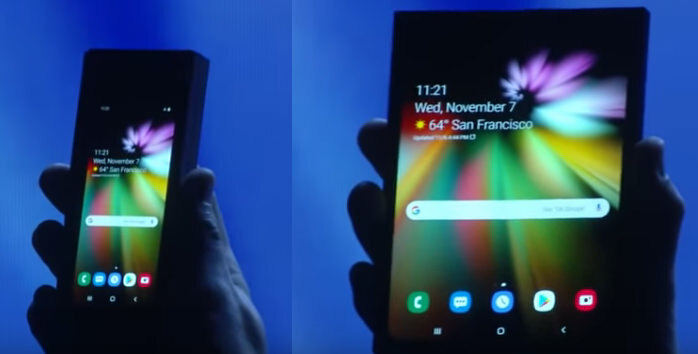 The future of smartphones looks foldable after tech-giant Samsung revealed its foldable smartphone which they're calling the 'Infinity Flex Display'. Flexible, foldable smartphones look to be in our future as Samsung is the second tech company in less than a week to announce such a device. The Royole FlexPai is a smartphone and tablet combo was revealed to the world at the start of November and overnight, Samsung has showcased their own foldable smartphone technology. Called the Infinity Flex Display, the device starts as a tablet-sized screen and it can be folded down into a smartphone-sized device. When folded into the familiar smartphone-size, you can use a smaller screen that's built on the outside of the device so you can use it as a normal smartphone that easily fits in a pocket. "Users now have the best of both worlds: a compact smartphone that unfolds to reveal a larger immersive display for multitasking and viewing content," says Samsung. As the device unfolds, apps seamlessly transition from the smaller screen to the large display where up to three active apps can be used at the same time. There's no word on when something more than a prototype will be available but Google has confirmed they are working with Samsung, and the Android developer community, to bring the device to mass market. The full device wasn't fully revealed either as Samsung is keeping the inner workings under wraps until it's released (the lights were also dimmed to make it harder to see how the Infinity Flex Display works). You can learn more about the new Flexible, foldable smartphone/tablet from Samsung in the below video which was recorded at the Samsung Developer Conference. The video starts at 1-hour, 23-minutes as this is where the device is discussed.